Irish: Do you have any news? WTF is Justin looking at??? I agree. This will be the greatest building constructed in NY since the ESB. The Museum of Modern Art is reconsidering razing the former home of the American Folk Art Museum, a decision that had sparked sharp criticism from the architecture community and others. MoMA officials announced Thursday that they have hired the New York-based architecture firm Diller Scofidio + Renfro to design the museum’s planned expansion, and MoMA has granted the architects latitude to consider incorporating the folk-art building into the expansion rather than demolishing it. MoMA officials last month announced plans to demolish the 12-year-old folk-art building, which is adjacent to MoMA on West 53rd Street, saying it was incompatible with their expansion plans because its floors would not line up with MoMA’s and because its textured bronze façade was inconsistent with MoMA’s glass aesthetic. MoMA bought the critically-acclaimed building in 2011, after the American Folk Art Museum defaulted on nearly $32 million in bond debt. A chorus of architects and designers, including the Architectural League of New York, have decried the demolition plan, saying it runs counter to MoMA’s mission of celebrating and preserving modern and contemporary art, architecture and design. So what options are there? Rebuild it elsewhere? Incorporate its facade into the lobby? They could save the facade and install it at another location. The Folk Art facade really goes well with the Tour Verre. Just reinstall the facade. It shouldn't be difficult. It isn't a glass box, to be sure. With the spider web design motifs (or is it conceits? ), Tower Verre is much closer to a cocoon than a euclidean form. And considering that New York is a city, IMHO, a man-made form is preferable to an encrusted web, no matter how tall. Dismantle the precious artifact and move it to MePa. He's talking about MoMA being the encroaching glass box, not the Nouvel tower. He's not referring to Tower Verre (which, as you can see in your own picture, would be built NEXT to the Folk Art Museum, not on it). 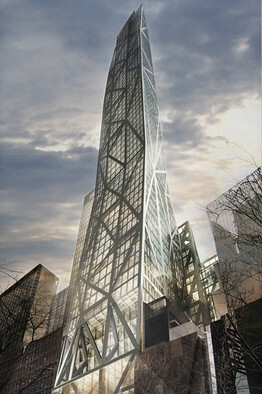 Rather, the "glass box" he is referring to is the extension connecting Tower Verre and MoMA that would be built in place of the Folk Art Museum. Hines in 2009 shows the proposed tower. to revive the stalled condo development. A Singapore real estate family and a group of Asian banks are in advanced discussions with developer Hines to revive a stalled luxury condo development next to Manhattan’s Museum of Modern Art, according to people familiar with the negotiations. The Kwee family is considering a $300 million equity investment in the metal and glass tower designed by Pritzker prize winner Jean Nouvel. Singapore’s United Overseas Bank U11.SG -0.81% and other lenders are in discussions to make up to $800 million in construction loans, these people said. Spokespeople for Hines, the Kwee family and United Overseas Bank declined to comment. An agreement with the Asian group would breathe new life into a highly anticipated project that was shelved when the downturn hit. In 2007, Hines unveiled plans for the building connected to the museum. But the tapering tower had been largely stuck in limbo until talks began several months ago with the Asian investors. Known as Tower Verre, the building located next to the museum is slated to include additional museum gallery space at the base. Most of the rest would be luxury condos. Hines acquired the lot next to the museum for $125 million in 2007 and agreed to a mixed-use building. Later that year, the Houston-based developer unveiled a 1,250- foot tall tower that was high enough to see eye-to-eye with the roof of the Empire State Building, and included the possibility of a five-star hotel. The economic downturn slowed the project’s progress, and it suffered another setback in 2009 when the New York City Planning Commission instructed the developers to reduce the height by 200 feet. Mr. Nouvel offered a new, shorter design that won city approval, but the project remained stalled while Hines looked for financing in a difficult market for large construction projects. Talks with the Kwee family and Asian banks began last year, say people with knowledge of the discussions. The family is one of the wealthiest in Singapore and one of the city-state’s largest landlords. It owns Pontiac Land, a privately held developer and hotel operator. Forbes recently put the Kwee family wealth at $4.6 billion.